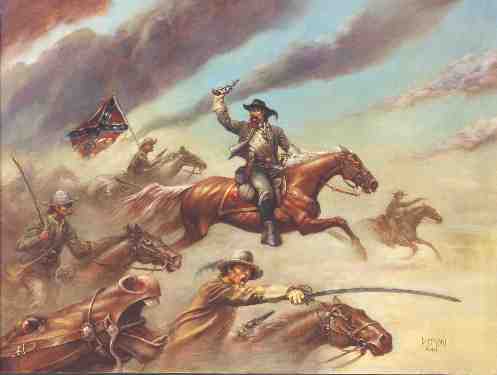 Painted as cover art for Ride Rebel Ride by Randal L. Greenwood (1996 Tor/Forge). 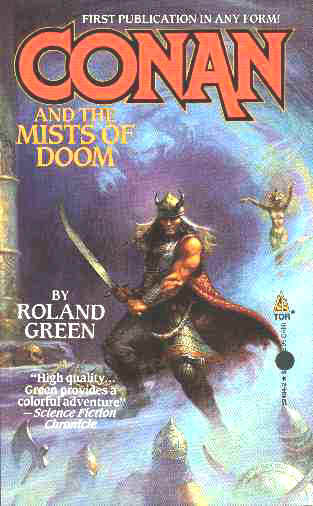 Mists of Doom (oil on academy board, 20" x 30") was produced as cover art for the Tor book Conan and the Mists of Doom by Roland Green (1996). It was my first published work. The predominate thought as I developed the painting was to put Conan in armor rather than in bathing trunks with a pretty belt. As the book placed the Cimmerian in Turan, I used Middle Eastern/Persian armour as my reference. When I received the commission I went to my folks' house and found my old Conan books by Howard and reread them. Having not seen them since high school, I thought they may not be as good as I remembered. As I was reading, I realized Howard's work was better than I remembered. The stories stood up after all those years. Howard needs no apologies. His work has grounding in history, the great myths, and literature, which he then wove into a believable world with gutsy characters. There are no "reluctant heroes" in Howard's worlds. 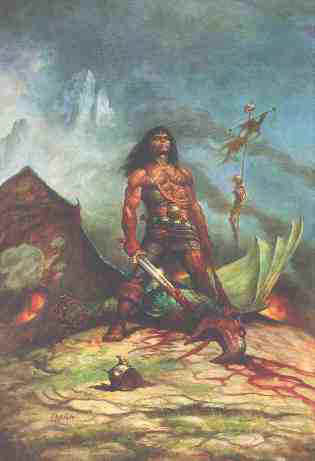 It was the rereading of Howard's Conan that got me fired up for this painting. And although it was my first work in the field, it is still one of my favorites. 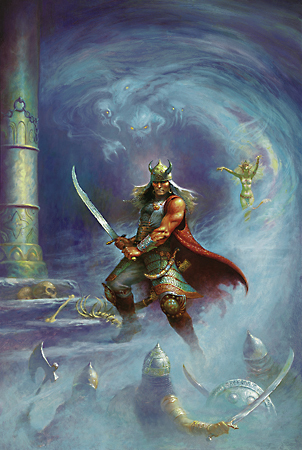 Painted as cover art for Roland Green's Conan and the Death Lord of Thanza (Tor Books 1997), this piece has been extensively reworked since its publication. The entire composition stems from the request to showcase Conan's "very handsome face". Upon publication that face, and most everything else, was repainted to reflect a grimmer aspect, more true to the original character.